You are here: Home / Ask an Expert / Ask An Expert: What is the best way to respond to negative feedback about my company online? Ask An Expert: What is the best way to respond to negative feedback about my company online? At some point, most brand with an online presence will have to deal with negative feedback. It could be in the form of a social media message, a comment on your blog or a Google review. It could be once or twice, or maybe even a steady stream of criticism. It is essential that you approach negative feedback with a level head and the right attitude. Also, don’t discredit the poster’s opinion. And even if your in a position to do it, do not delete the comment. Think of every complaint as a learning experience and an opportunity to change a customer’s mind. How can you best turn that negative into a positive? 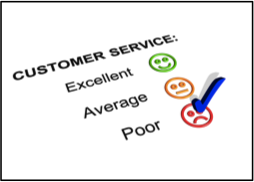 With the right response, you can not only address the unhappy customer’s issues but possibly turn them, and others, into loyal customers. 1. Evaluate the comment. Not all negative feedback is equal. Some things to consider: Who wrote it? Where was it posted? What was the comment about? Why was the person upset? Is the comment likely to scare off new customers? The answers to these questions should influence how you respond. For example, a disparaging comment posted anonymously on Twitter is less worthy of serious response than a dissatisfied customer that wrote a blog post about their negative experience. 2. Determine who should respond. Depending on the severity, location or direction of the negative comment, you may want to evaluate who should reply. If criticism was left on a blog post, it’s probably best that the response come from the author. If someone published a bad review on Google, someone with authority within the organization should respond. If there is the potential for legal issues, consult your lawyer or legal department about a proper response. 3. Time your response. Don’t make the problem worse by firing off a reply in the heat of the moment. Take your time and do it right. If the complaint is minor, you have more time to respond than if the complaint is major, but don’t rush yourself. Taking too long to answer a major complaint could cost you current and future customers. 4. Respond as if to “Every Consumer.” Sure, technically you’re crafting an answer to the person that complained. However, with your response, you should address anyone else who might happen to be “listening” to your conversation. Odds are the average consumer isn’t going to know the full story behind the complaint, but they could make assumptions based on both the criticism and the response. With your words, let the disappointed consumer know you’re listening, while showing the rest of the world that you care about the experiences of the people using your products or services. Don’t forget to thank the poster for bringing his or her poor experience to your attention. Be sincere! 5. Choose your words carefully. Use short, succinct sentences and keep paragraphs to no more than four or five sentences. And don’t ramble on and on in your response, as consumers may view your reaction as defensive. Once you’ve crafted your message, read it and re-read it over and over again, tightening up loose grammar or paring down any words that detract from your message. Sign it with your real name, title, company name, and Web address. Once you’ve sent your response, be proactive about determining if the reviewer received your message. When you seriously address a customer’s negative experience, there is a distinct possibility that he or she could update their review to explain how you made it right. Even if they don’t change their opinion, your direct and honest response could very well sway other consumers to your side.